Info Shale - How is it Formed? 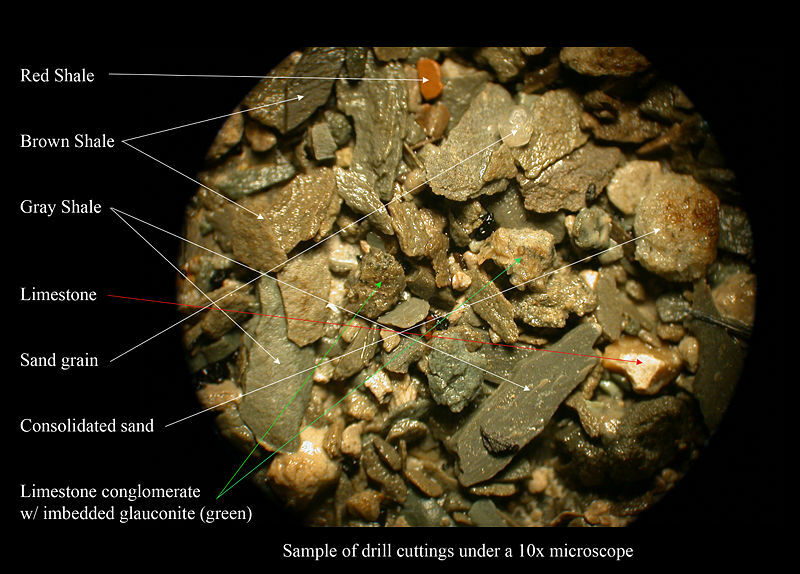 Sample of drill cuttings of shale while drilling an oil well in Louisiana. Sand grain = 2 mm. in dia. Shale is a fine-grained sedimentary rock that is formed by the compression of muds. This type of rock is composed primarily of quartz and minerals that are found in clay. Shales can be broken easily into thin, parallel layers. Shale is ground up for use in making bricks and cement. Sedimentary rock - pronounced sehd uh MEHN tuhr ee, is rock formed when mineral matter or remains of plants and animals settle out of water or, less commonly, out of air or ice. Sedimentary rock covers about three-fourths of the earth's land area and most of the ocean floor. In some places, such as at the mouth of the Mississippi River, sedimentary rocks are more than 40,000 feet (12,000 meters) thick. Geologists estimate that sedimentary rock has been forming for at least 31/2 billion years. Sedimentary rock is one of three major kinds of rock. The others are igneous rock (Granite) and metamorphic rock (Marble). There are many types of sedimentary rock and they have a variety of uses. The most common sedimentary rock is shale. It is made of compressed mud--that is, a mixture of clay and silt (fine particles of mineral matter). Shale is used in making bricks. Limestone, another common sedimentary rock, is made chiefly of the mineral calcite. Limestone is used for building, for making chalk, and for various other purposes. Cement is made of limestone with a little shale mixed in. Sandstone, made of sand, and conglomerate, composed of sand or gravel particles, are also commonly used for building. The sand or gravel particles in sandstone and conglomerate are held together by a mineral cement. Coal, which consists entirely of compressed plant remains, is a major source of fuel. Most sedimentary rock starts forming when grains of clay, silt, or sand settle in river valleys or on the bottoms of lakes and oceans. Year after year, these minerals collect and form broad, flat layers called beds or strata. The layers, which differ from one another in composition or texture, distinguish sedimentary from most igneous and metamorphic rock. After thousands of years, the beds of fine silt and clay are squeezed into compact rock layers by the weight of other layers above them. Water that trickles slowly through layers of coarse sand and gravel, deposits mineral cement around these particles, cementing the layers together to form rock. Where the earth's crust is deformed or eroded, large areas of buried sedimentary rock may be exposed. Most fossils are found in sedimentary rock. The fossils formed when sediments covered dead plants and animals. As the sediments changed to rock, either the remains or the outlines of the plants and animals were preserved. Some limestone is made entirely of fossil shells. Shales that are subject to heat and pressure alter into a hard, fissile, metamorphic rock known as slate, which is often used in building construction. "shale". Chambers Dictionary of Science and Technology. (1999). Chambers Harrap Publishers Ltd. Rocks: Materials of the Lithosphere - Summary. Retrieved on 2007-07-31. Contributor: Maria Luisa Crawford, Ph.D., Prof. of Geology, Bryn Mawr College.